A Scion is stuck in a mudslide on Topanga Canyon Boulevard near Malibu Thursday March 15, 2018. Two mudslides triggered by overnight rain prompted closures Thursday in the Topanga Canyon area, where one person was rescued and several cars had to be freed. California Highway Patrol received reports of the first mudslide at 1:48 a.m. Up to five vehicles were stuck. 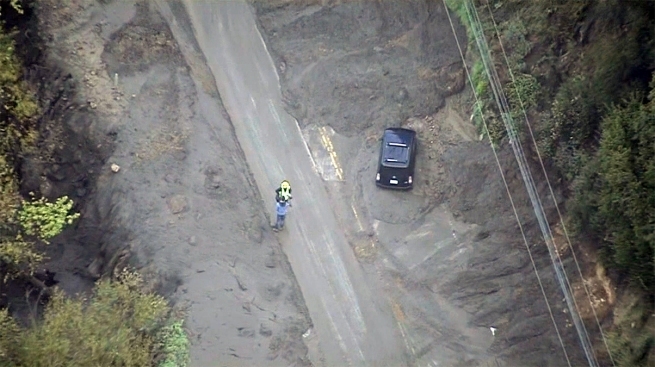 A second mudslide was reported an estimated 100 yards away from the original site, where one vehicle remains trapped. Topanga Canyon Boulevard from Pacific Coast Highway to Grand View Drive is expected to remains closed until at least Friday morning. Authorities said early Thursday that the road might not reopen until Saturday. Before crews are able to begin the cleanup process, they said they must wait for the mud to dry. No injuries were reported and no structures appear to be threatened.